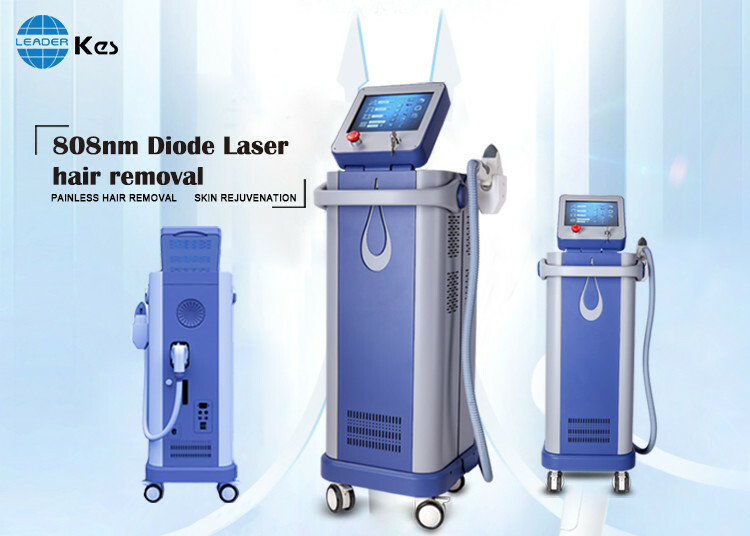 808nm Wavelength: Professional hair removal for the widest range of hair types and color -especially light-colored and thin hair,dark skin type. Make it ideal for treating the arms,legs,cheeks,beard,underarm and Bikini etc. 1. Beautician is required to offer consultation to the patient before treatment. 2. Shave unwanted hair before treatment. 3. Clean skin to remove cosmetics and sunscreens...etc. 4. Apply 1-2 mm cooling gel on the entire treatment area. 5. Operator and patient should wear glasses and goggles properly. 6. Set proper parameters according to patient's Skin Type, Hair Color, Hair Density. 7. Verify that the handpiece tip is cold, sliding handpiece to cool down the treatment area. 8. Click 'Ready' to start treatment and ensure the handpiece perpendicularly and tightly contact the treatment area during treatment. 9. Adjust the parameters during treatment according to patient’s feeling. • Follicle erythema and oedema, this endpoint typically appears a few minutes after the laser passage and this immediate skin response gives evidence of the effectiveness of the treatment. • The pigmented hairs vaporise releasing a typical smell of smoke due to the burnt keratin. 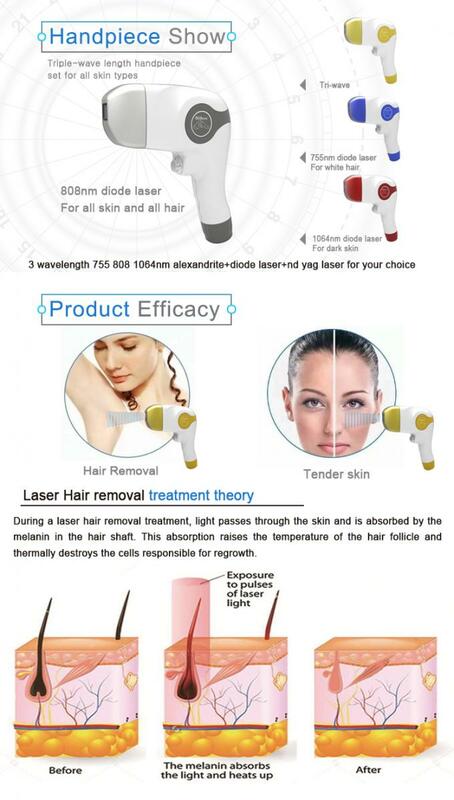 808nm handpiece: The laser wavelength 808nm goes through the skin surface to reach the root of hair follicles, effective for light, golden, dark hairs and all skin types.Most popular hair removal machine in beauty salons and clinics. 808nm golden standards in aesthetic . Tripe wavelengths (808+755+1064nm): Three wavelengths in one, provide excellent solution for various skin types and hair colors. 1064nm handpiece (specialized for darker skin types ): 1064nm Wavelength specialized for darker skin types. Treatment areas such as the scalp, arm pits and pubic areas. 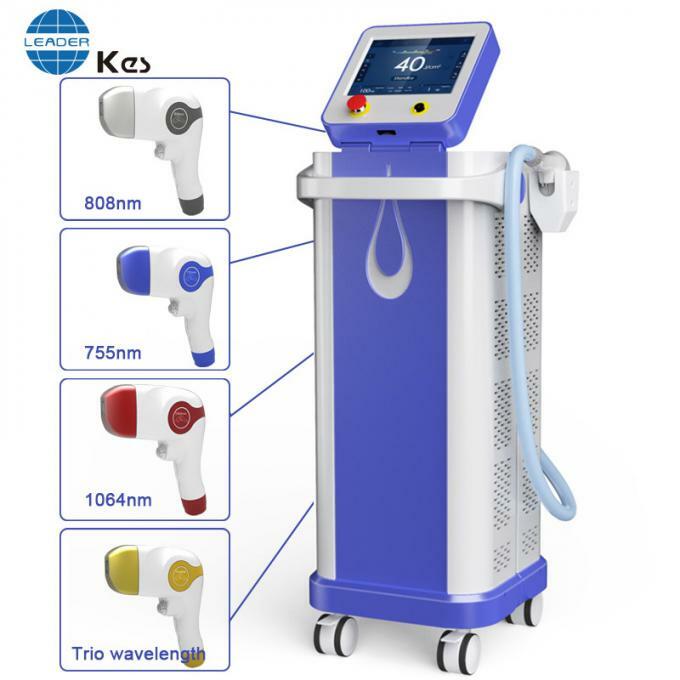 755nm handpiece: 755nm Wavelength optimized for treatments of skin types up to IV with less melanin, especially good for light, brown and gold hair. 1. Dual-channel cooling system for epidermal protection . 2. Japan Imported Double Filter prolong life time of handpiece . 3. Updated “U” shape handles becomes lighter and smoother, treatment smooth and depilate painless. 4. Combining “In-Motion” treatment with Sapphire contact cooling technology ,produce a rapid hair removal with painless . Gradual Heating is the KEY! Beijing KES Biology Technology Co., Ltd. is the professional manufacturer of beauty machine for more than 10 years. Our machines got the ISO 13485, TUV CE, CE, FDA certification etc, all machines past strict test. We have confidence to provide high quality and safe machine that exceed customer satisfaction. Professional R&D team and service team provide hardware design &software OEM&ODM items .